Good morning, dear friends! I am writing this post feeling very awkard…It is the first after my sister’s quitting our blog…I am sad about that but on the other hand I know that she made this decision for her own reasons and that she is doing fine! Her new way of life and daily routine are very different ever since she moved to Crete…Some of you may have thought that we split due to disagreements or something like that. No, guys! Far from that! She just got tired of blogging and she gave it up…I am really grateful to her because she is the one who introduced me to the magical world of food blogging! We had a great time, we had fun «building» our internet kitchen, which of course is open for her and she can come and cook whenever she feels like it! My dear sis, I hope you always do things that fill you with joy and make you happy! I love you to the moon and back! I don’t want to tire you by saying more… So let’s move to the recipe! Today we are making a delicious pasta dish! It is simple, easy and healthy! My favourite summer veggie plays a great part in this sauce! A spicy roasted eggplant cream poured on penne and here you go! You have a fine pasta dish with just few humble ingredients! I hope you try it and enjoy it as much as we did! Place eggplants on a baking sheet lined with parchment paper. Make holes with a fork and roast them for about 40 minutes at 180 C until cooked through. Allow to cool. Then peel them and blend their flesh in a food processor. Add all the spices, parsley, garlic and blend again. In the meantime cook pasta according to package instructions. Transfer this cream into a pan over medium heat. Pout the soy cream and allow to simmer for a few minutes. Stir until well combined. In the end pour the oil. Drain pasta and put it in the pan. Stir until the penne are well coated. 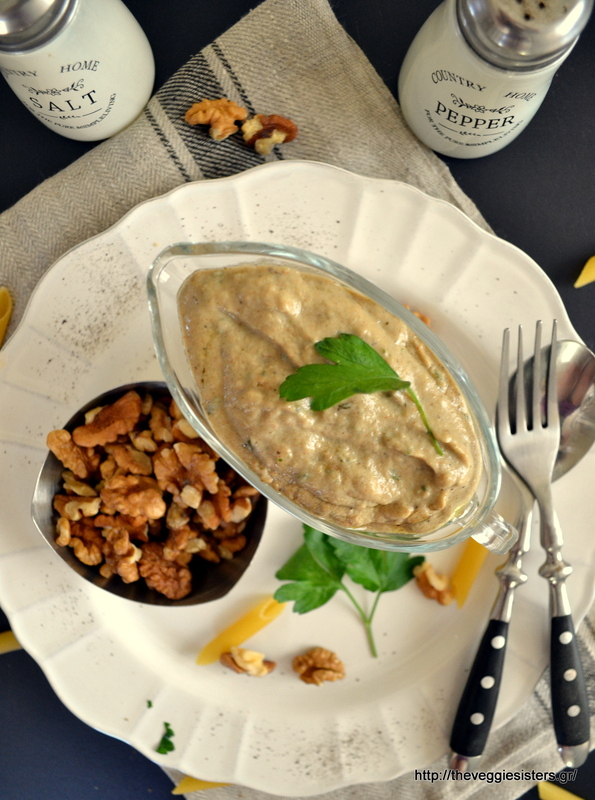 Serve and top with walnuts and parsley. Enjoy! Share the post "Creamy roasted eggplant pasta"